Tommy Barnds is a standout Senior midfielder for Sacred Heart Prep and ADVNC, committed to follow in his father’s footsteps to play lacrosse at Princeton next August. Tommy’s father, Tom Barnds, was an All-American defenseman for Princeton, graduating in 1990. That’s where the story sits right now. But of course, the story did not start there. When Tommy was a young boy, his dad had no aspirations this would all happen. In fact, he didn’t think his son would have options to play lacrosse in the Bay Area at all. Tom has been coaching and Tommy has been playing on teams all over the Bay Area ever since. Shortly after the Barnds started with the Firehawks, Tom heard that Chris Rotelli, a fellow former All-American lacrosse player, was moving ADVNC to the Peninsula, where the Barnds family had settled. 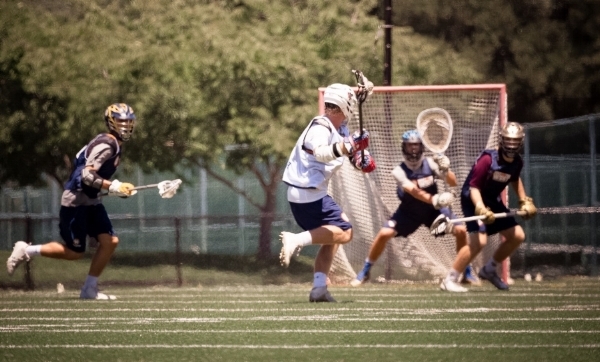 He and some other lacrosse-loving parents reached out to Chris and asked if their sons could try-out for ADVNC, and they have been playing for Rotelli and ADVNC ever since. After a junior season at Sacred Heart Prep where he scored 65 goals and had 34 assists, won WCAL Player of the Year, and was named a US Lacrosse All-American, Tommy parlayed his combination of talent and hard work into a spot at one of the top lacrosse programs in the country. When Princeton offered Tommy a spot on their team, his recruitment was over.